My wife and I have wanted to make a return visit to Ume Restaurant for quite some time following our memorable lunch back in August 2013. We decided to drop by for lunch last weekend after a stop at our new favourite coffee place, Artificer Speciality Coffee Bar and Roastery, which is just across the road from Ume. The coffee there is seriously awesome, but more on this another day! 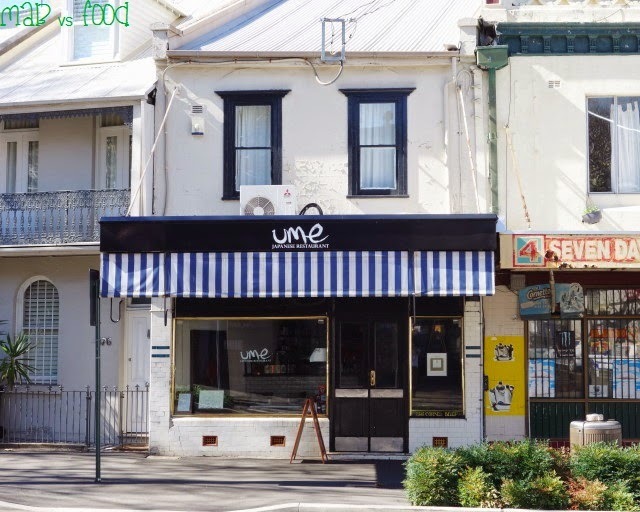 Ume is located in a relatively quiet section of Surry Hills on Bourke St. The decor at Ume is pared back with white walls, dark wood and a plum blossom painting on one wall. The head chef and owner is Kerby Craig, who worked at Tetsuya's back when it was in Rozelle and Koi in Woolwich before opening Ume. The menu at Ume is Modern Japanese cuisine, utilising classical Japanese techniques, modern flair and local, seasonal ingredients. There are a la carte options or set menus available (5 courses for $67 or 7 course set menu $87). As we had only tried a la carte courses at Ume in the past, we were keen to try the 7 course set menu this time. With advance notice, Kerby Craig was able to prepare a separate vegetarian set menu. There's a great selection of sake, shochu, whisky and umeshu at Ume. I opt for the Izumibashi Nama Genshu (180ml, $21) to start the meal. This sake was served chilled, perfect for a 39 degree day. My wife went for Ume's house made yuzu soda. Being a yuzu fanatic, I loved this soda! For me it was just right: refreshing, tangy and not too sweet. I'm calling this my favourite yuzu beverage in Sydney! We loved this yuzu soda so much that several rounds of this drink were in order. My menu starts with beautiful slices of kingfish sashimi dressed in a white ponzu and served with Ume's house made yuzu-kosho. The kingfish was delightfully fresh with firm textured flesh. The tart and peppery notes from the yuzu-kosho were a perfect accompaniment to the kingfish. My wife's first course was char grilled asparagus, avocado, Japanese negi, Ume's house made yuzu-kosho and ponzu. This was a simple yet enjoyable course. My wife commented on how good that ponzu sauce was. So much so that she would have run her finger through the sauce if no one else was watching. The next course was a revised version of Ume's signature dish - seared Hokkaido scallops. Scallops were thinly sliced, like a carpaccio, and fanned out in a shape of a flower. The texture of the scallops was just beautiful - smooth and velvety and the flavours in this dish were on point. The scallops were sweet, the kombu brown butter was loaded with umami and little rocks of finger limes provided bursts of acidity. I thought this version improved on the original, which was already an excellent dish! My wife's second course consisted of the same elements as my course (i.e. soy, kombu brown butter, and finger limes), with roasted house made yuba (tofu skin) taking the place of scallops. The yuba had a soft and silky texture. But it was the roasting of the yuba, which imparted an amazing toasty/smoky flavour, that really made this dish stand out. This was one of the favourites courses for my wife this meal. Pork belly was slowly braised in soy and dashi stock and then finished on the charcoal grill. This must have been the softest layer of pig fat that I have ever eaten: so good and just melting away in the mouth! The meat was also very tender and tasty. But it was the karashi su-miso (a combination of Japanese mustard, miso and egg yolk) that really brought this dish together. The sweetness and pungent heat of the sauce went really well with the pork belly. Pork crackling was sprinkled on top like you would sprinkle furikake over rice for texture. My wife had the shiki no salad, which we ordered last time and was our favourite course from the previous meal. Our assessment of this dish doesn't change: it's fantastic and loaded with umami. The highlight of the salad were the fried brussel sprouts. The crispy sprouts were so so delicious when dipped into that creamy tamari custard and addictive soy and ginger dressing. The assorted roasted heirloom carrots were also delicious. Next was one of my favourite vegetables in Japanese cooking, eggplant. Nasu dangaku (miso eggplant) has been replaced by yaki nasu (charcoal grilled eggplant). The eggplant, which was sitting in an umami-filled wari shoyu broth and nori oil, was smoky, fall-apart-tender and juicy. The eggplant was served with grated ginger and katsuo-bushi (bonito flakes). My wife's yaki nasu was topped with crispy nori rather than katsuo-bushi. Thin slices of lightly cooked David Blackmore wagyu beef (marble score 9+), asparagus and shimeji mushrooms were immersed in a soy and mirin reduction, sukiyaki style. David Blackmore produces some of the best beef in the country and this was evident here. The beef was amazingly tender and flavoursome when coated in the soy and mirin reduction, kind of like a refined teriyaki sauce. The onsen tamago with perfectly oozing yolk and soft, just cooked egg white made for an excellent dipping sauce for the beef and vegetables. This was my favourite course of the meal. I don't think you can have the wagyu sukiyaki without a bowl of perfectly cooked, fluffy rice to mop up the sauce. Akita-Komachi is a high end, short grain rice from Akita prefecture in Japan and the rice was cooked with dashi stock. My wife's final savoury course was kinoko moriawase (or assorted mushrooms) with bamboo shoots, yuba and soy; another simple, yet enjoyable dish. The first dessert course consisted of strawberry compote, white chocolate caramel, matcha custard, dango (Japanese glutinous rice ball), ginger bread and white chocolate ice cream powder. I love my matcha bitter and the matcha custard in this dessert was just that. The sweetness of the white chocolate and strawberries were a great match with the bitterness of the matcha custard. This was my favourite of the dessert courses. I ordered a Uzen Shiraume Ume Yusui to have with my dessert courses. The tart flavours of ume were wonderfully balanced with moderate sweetness, creating a ume-shu that was really pleasant to drink and not sickly sweet. The final course of the menu was just as pleasant to stare at as it was to eat. I had a similar dessert in my previous meal at Ume; except this time mango was in season rather than mandarin. The mango sorbet was nice and refreshing. The mango tofu was interesting and was -more like the firm tofu variety or a jelly rather than a soft tofu. This dessert also utilised the matcha and fruit combo with frozen green tea. The shards of dehydrated chocolate mousse and mochi provided textural contrast in this dessert. Like my first meal at Ume, I was highly impressed with the food; every course was enjoyable! Ume's food utilises classical Japanese techniques which are familiar to me but it's the modern flair that elevates the food to another level. My verdict of Ume remains unchanged: Ume = Yummeh! Highlight: Wagyu sukiyaki with a bowl of rice. Lowlight: Expect Japanese-sixed portions, after all this is a Japanese restaurant.